I’m starting to get seriously behind on my writing, in regards to my culling project. In reading, I’m actually at the letter “E” in my Marvel collection. So I’ll be trying to catch up over the next few weeks. There are 2 very good reasons as to why Power Girl is the most ridiculous character in superhero comics. Now, despite the utter silliness of the character, or specifically the character’s costume, she does have her charms, and in recent years has gotten quite a bit of attention within the DCU. Power Girl collects a JSA Classified run that featured her trying to discover her “real” origin, as until recently PG’s origin was one of the most complicated in the DCU. Geoff Johns worked his magic however, and as a result she’s become a small, but entertaining mainstay in superhero comics. A New Beginning and Angels and Apes collect her new unlimited series, which happens to be one of the VERY few DC comics I currently collect. It reminds me a lot of the DC comics I liked as a kid. It’s simple, doesn’t take itself too seriously, and Amanda Conner’s art is always enjoyable. If you like your superhero comics fun and fun and fun, these are worth your while. 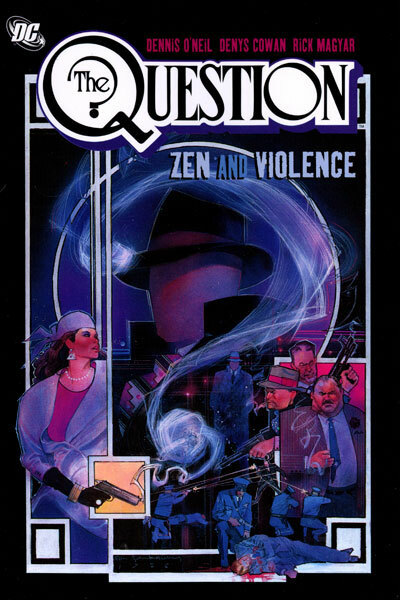 Dennis O’Neil and Denys Cowan’s Question is one of the most critically acclaimed, yet criminally under read series of the 1980’s, and Vic Sage has long been one of my all-tine favourite DC characters. The Question is one of those DC ’80’s series that only work if you take them as a separate entity. The minute you try to figure out how the realistic events taking place in this book would jibe in a world with Superman or Wonder Woman, you’re done. Essentially this is a grim and gritty crime/politics book that O’Neil used as his way of exploring a lot of the societal/political issues he cared about at the time, much in the same way that Steve Ditko had in mind when he created the character in the first place, even though O’Neil and Ditko’s politics couldn’t be further apart from each other (Think Michael Moore Vs. Anne Coulter with less screaming and you’ve got the jist of it). This is great if you’re me, but not something I would recommend to everybody. 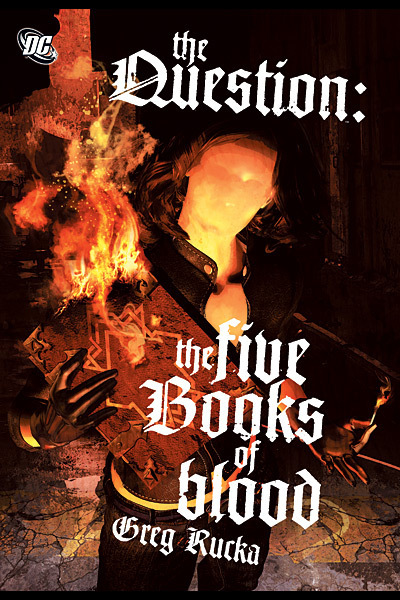 I liked this quite a bit upon reread, though I wished that O’Neil had spent a little more time on long-term plotting, as some of the arcs/characters seem to drift a bit. Cowan’s moody pencils hold up quite well. After the ’80’s series ended, the Question wasn’t used much, and never really seemed to find a new home anywhere. So a few years back, DC and Greg Rucka decided that they would reinvent the character in the pages of their landmark maxi-series, 52. Rucka capitalized on the great work he had done with the Rene Montoya character in Gotham Central, and decided to make her the new Question. To mixed results. Don’t get me wrong, I love Montoya as the Question, and would love nothing more that for Rucka to write a monthly Question comic book. But much like her predecessor, she seems to be out-of-place in a world full of gods and superheroes, and these two trades seems to teeter perilously close into the realm of mystical silliness, which isn’t good for for a character that is essentially supposed to be a street-level investigator. In Rucka’s defense, there aren’t many writers alive that could have made any sense of the convoluted garbage known as Final Crisis, so I think he can be forgiven for his sins here. There’s still some good character work here, and I hope that someone takes the foundations that Rucka lays here and does something worthwhile with her. This entry was posted in Comic Books and tagged Power Girl; Question; DC; Comics; Dennis O'Neil; Geoff Johns. Bookmark the permalink. Re: Power Girl – No one is (successfully) fighting crime in that outfit. More importantly, where does she buy her sports bras? Or is lifting & separating one of her superpowers? Her sports bra came with her in the same rocket that she flew to Earth 2 in as a baby. Duh.